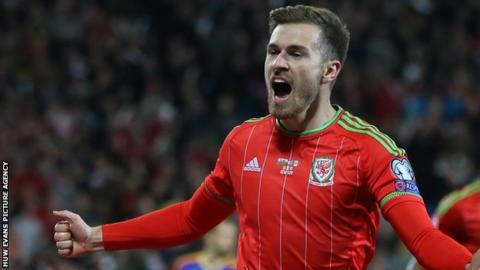 Midfielder Aaron Ramsey has not yet replicated his Arsenal form for Wales, according to his former international team-mate Danny Gabbidon. Ramsey, 25, could return for Arsenal against West Ham on Saturday after a month out with a thigh injury. Former defender Gabbidon hopes Ramsey will shine for Wales at Euro 2016. "I'm expecting a big tournament from him because I think there's a lot to come from him in a Welsh shirt," Gabbidon told BBC Wales Sport. "The last couple of seasons at Arsenal he's done really well but I think he hasn't quite transformed that form into a Wales shirt. "So I think there are a few points to prove from his point of view." Ramsey has scored six goals in 34 appearances for Arsenal this season, while in the previous two campaigns he scored 10 and 16 goals. He struck in his last outing for Wales, a 2-0 win against Andorra in their final qualifying match for Euro 2016. That took his tally to 10 goals in 38 appearances for his country. Injuries mean the former Cardiff City player has missed subsequent friendlies against the Netherlands, Northern Ireland and Ukraine. He is set to return to action this weekend for Arsenal, who are 11 points behind Premier League leaders Leicester with a game in hand.